n a world designed by large women, things would surely be different. Airline seats would be at least ten inches wider. Chairs would be larger and sturdier. Bras would be better made, better looking, and cheaper. And instead of only willowy-thin dancers, the stages of the world would be graced by more women the size of those in Big Dance. 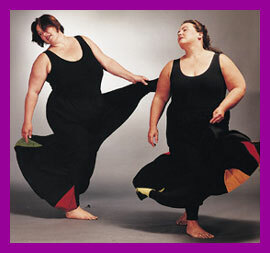 I recently watched these large dancers in a one-hour segment of Hot Topics, a documentary show on Canadian cable channel WTN, which originally aired in January of 1999. My tiny TV screen could not diminish the spirit or energy of Big Dance. Big Dance is both a troupe and the class that feeds it, led by choreographer Lynda Raino at her dance school in Victoria, British Columbia, Canada. As she explained on the show, Raino, an esteemed modern dancer in North American circles, got the idea for Big Dance after collaborating with a large woman on an art project. The woman said that she’d take a dance class if Raino offered one specifically for large women. Raino jumped on the idea immediately. But the actuality of large dance came as a surprise to her. Dance teachers will testify that every body, no matter what size, has its own limitations. Part of learning dance is about exploring boundaries and making the most of what you have, something with which Raino is intimately familiar. A few years ago Raino suffered a badly herniated disk and required both surgery and rehabilitation. She was told that she might never walk again, let alone dance. But Raino emerged from this situation even more determined to dance, and she set out to learn what she could and couldn’t do. “My dancing has changed incredibly in the past year, since the surgery,” she says. “I used to love spinning, pirouettes, jumps. But the control and high extensions of my legs are gone. So now I must express myself another way.” In class Raino offers that same adaptability to her students. Bends may be modified or leaps reduced: really, anything can be changed as long as the feel of the movement is preserved. Considering the collective experience of large women in dance institutions, these feelings are understandable. Entire generations of fat girls have suffered through classes, and many have been screened out of dance entirely, thanks to family, teachers, or just the harsh and narrow expectations of the dance world. Hot Topics includes extensive interviews with members of Big Dance, the youngest of whom, Jennifer, recalls how much she loved dance as a girl. 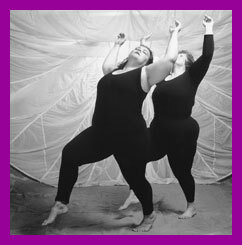 The dancers are uniformly grateful for the therapeutic possibilities offered by dancing with other large women. Says Terryl, a plain-spoken Ph.D. student, “The first year I was in Big Dance, it saved my soul. Any creative endeavor, when you put your heart and soul into it, is bound to be therapeutic”. art of the craft of dance is performing, and, like any dance troupe, Big Dance performs for the public. 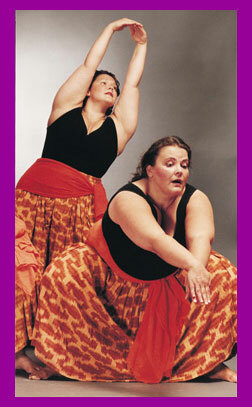 Soon after the Hot Topics show aired, Raino and Big Dance staged their first full-length Big Dance concert, consisting of works about being a large person. Usually the group’s performances are more general in focus. They dance as part of the Lynda Raino School recital and have been invited every year to participate in the University of Victoria’s antifashion show. The dancers are currently modeling for an art show on classical beauty and will be performing at the gallery opening. They are also preparing for their part in Dancers for Life, an international dance benefit for AIDS taking place on AIDS Day (December 1). Possibly their greatest triumph was an appearance at the North and South American World Dance Alliance, a conference about dance in North and South America that took place in Vancouver, British Columbia, in 1997. 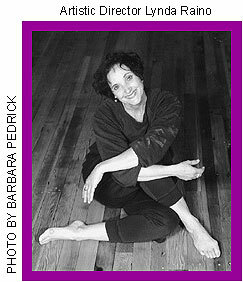 Upon reviewing a video of Big Dance’s choreography, conference organizer Judith Garay saw the value of the group’s work and extended an invitation to them. Individual copies of the Big Dance video can be ordered through Kinetic Video: $39.95 for at-home use, $179.95 for institutional or public viewing. Their web site is www.kineticvideo.com, or call 800-466-7631 (United States) or 800-263-6910 (Canada). After two-and-one-half years of picking up dance classes wherever she could, MARINA WOLF is enrolling in the dance certificate program at Santa Rosa Junior College in Northern California. She wants to get more fat women in the dance studios and on the dance floors of the world. When she isn’t dancing, Marina is cooking, eating, or writing about cooking and eating. You can contact her at fullsun@sonic.net, especially if you have leads on custom-made dancewear (leotards, jazz pants, crop tops, and so on) in size 28.